An effective website for your business is more than just an impressive design. The website must also appear high in the search engine results, load quickly on mobile handsets and personal computers, bear an intuitive navigation and do what it is intended to do, whether it is selling your products or providing information. Moreover, the shifting design trends make many websites look outdated and not provide the functionality and information required to convert first-time visitors into paying customers. If you are in Saint John New Brunswick and surrounding areas, Rise Atlantic is a company that will do all of this and so much more. For several years, this company has been a leader in web development, search engine optimization, and online marketing, so they are well-versed with what it takes for your business to have a strong online presence. Rise Atlantic will build a website that has a direct appeal to your market, converts first-time visitors into customers and that is optimized for search engines. How Can Rise Atlantic Help? We are also masters in web analytics, which lets us prove the Return-on-Investment of our web development services by giving you a prediction of how your site and its individual pages perform prior to and after we have made the necessary changes. Cutting-Edge Design: With numerous website designs for you to choose from and customize your own brand, we shall give your website a new look and feel in a very short time. Web design trends are constantly changing, and we can help you remain on par with the trends. Rise Atlantic stays ahead of all new web design trends to bring you attractive web designs irrespective of whether your existing website only needs a minor facelift or you want to rebuild a functional and mobile-responsive website from scratch. Detailed Development: Our company’s team of PHP and Word Press developers shall make sure that your website’s back end is easy and inexpensive to maintain now and in days to come. Our developers and designers work together to aid in crafting elegant web designs that will fit your individual brand and create a functionality and user experience that you perceived as impossible. Sites in the modern-day dynamic web cannot stand still, so our company focuses on building a web presence that can be easily run by anyone. Most of the sites we design are easy-to-maintain and based on Word Press, a dynamic web publishing platform that is used by thousands of websites across the globe. Therefore, you can easily and quickly create some new pages, change the content on your website and maintain your blog with the least technical knowledge; it is just a point and click approach. Just like our clients in St John New Brunswick, our company values quality and believe in accomplishing tasks right in the first attempt. And when poorly written code is not easy to identify, the cost of fixing it isn’t invisible. The websites we develop are easy to maintain and upgrade. Therefore, any additional features or fixes that should be executed on your website will not pile any extra costs on your projects. It can be difficult to know when you are looking at the detailed workings of any website, but our web design work is always clean, perfectly-organized and developed in accordance with a solid methodology. The end product we give to you is simple to maintain, easy to upgrade and lends itself to some very easy design tweaks that will not drain resources or time out of your business. Why Should You Build Your Website With Rise Atlantic? If you are in St John Brunswick or the surrounding areas, one reason why you should use our company is that we offer premium hosting services on our secure servers, maintained and monitored by an expert team all-year round. This eliminates the hassle of looking for a separate company to help you host your website. We have it all in a single package. We are living in the age where you cannot afford to have a site that can be easily viewed on a laptop and not on a mobile handset. Moreover, a majority of internet users are now using mobile handsets to access websites so you need to have a website that is mobile friendly. We shall develop a site that will look amazing irrespective of the kind of device your visitors are viewing it on. All our designs adjust for smartphone and tablet users. We do not cherry pick codes from anywhere, put them together and give you a website, NO! 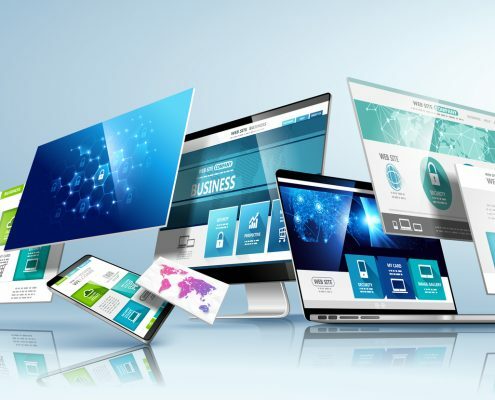 All our websites are built of flexible and search-friendly Word Press while at the same time integrating HTML5 markup to keep you in the loop for future website standards and micro data that will increase your visibility on search engines. Since we shall build your site using Word Press, making changes and updates to your site shall be a point-and-click affair, you must not be a developer to make the changes. Do not hesitate to get in touch with us to learn more about the web development services we offer. Whether you just want to give your website a facelift or want someone to develop, design and manage the entire process, we are ready to assist.